Our winners this week! Well done to Tino who has earned his second gold this week - Professor Perseverance! 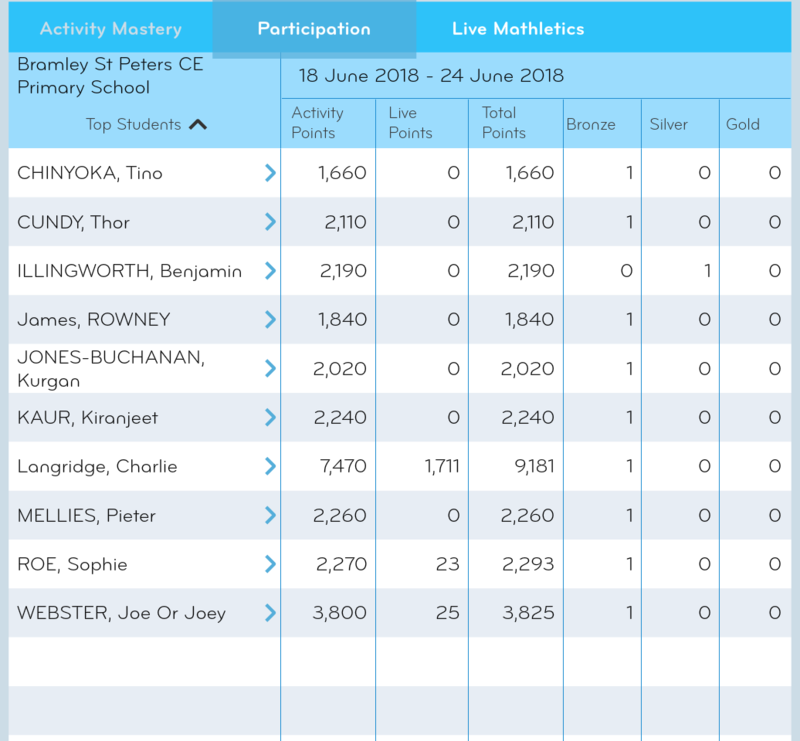 Winning classes and winning individuals for week ending 24th June 2018 - well done to all our winners this week. Our individual winners this week are Thor with 7107 points, Charlie L with 7230 points and Sophie R with 9611 points, Sophie is the overall winner. Ndanatsei has earned her 2nd GOLD certificate - well done Ndanatsei. A massive 'well done' to Kurgan for getting his Gold certificate this week. Our individual winners this week were Liam in 3rd place with 3,470 points, Connor K in 2nd place with 4,150 points and Ndanatsei in 1st place with a very impressive 13,720 points! Our class winners this week were 3LK. Most of the children came to our Mathletics club at lunchtime to try to improve their scores. Well done to Caitlin from year 5 who has earned her GOLD certificate during the holidays. Fabulous effort!! Winners from 26th March to 15th April. Well done everyone! Well done to Ndanatsei who earned a massive 13,370 points to win the trophy the week. In second place was Molly T with 9,310 points. Third place was taken by Joe W with 2,2390 points. 4BW are our class winners this week. A massive well done to Lewis W who earned his Gold certificate! Well done to Liam in year 3 for reaching Gold level this week. Ndanastei is our individual winner this week, with 4BW class of the week. Our winning class this week is 4BW with an outstanding 31,000 points. Second is 5CC and third is 6VH. Our individual winners are Ella May in 3rd place, Ndanatsei in second place and Leighton is our overall winner. Well done to Benjamin who has earned his GOLD!! Week ending 25th February 2018. Individually, our overall winner this week is Leighton Jenkins. Benjamin Illingworth is second and Rian-Rose Flanagan is third. Well done to you all! Our class of the week is 4BW. 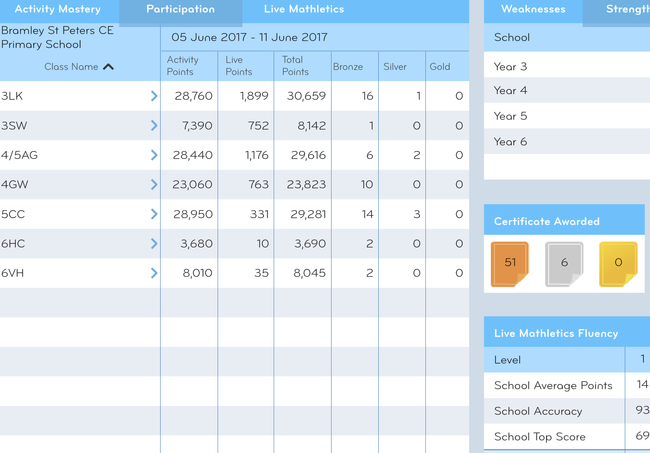 We haven't had as much activity on the main Mathletics site as our children have been busy trying out the new Multiverse game. If you haven't had a go yet, and you would like to create planets in space and get rid of space pirates, please try Multiverse. 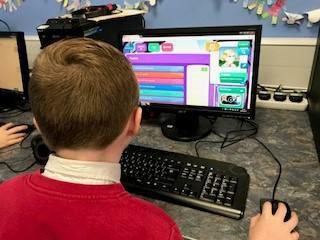 Here is a link to Mathletic's blog page which shows some of our children being the first in the world to try the new games. 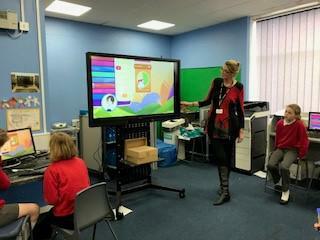 Bramley St Peter's children become the first in the world to play the newest Mathletics game - Multiverse. Children at our Mathletics breakfast club were joined by Jane Fisher, Mathletics regional manager to help to launch their newest game - Multiverse. 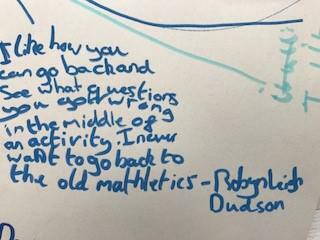 Our children wrote down their initial thoughts about the new times table game which were then rushed to the games' inventor who is in Australia! 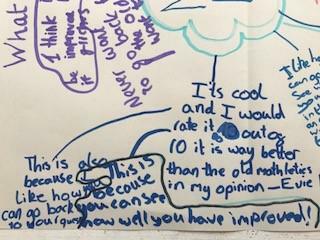 Comments included 'This is the best way ever to learn your times tables', 'It's cool', 'I love being able to move around in space and create planets with gases and meteors' and 'It's great to blow up space pirates just because you can do your times tables'. Joe Webster has earned his gold certificate this week. Well done Joe! Well done to our Mathletes who continued to do their work over half term! Our winning class for this week is 6VH. Well done year 6. Gold Mathletes are Lore Jones-Buchanan and Max Chen. Well done to our winning class this week - 6VH In second place is 4BW and third place goes to 3LK. Marvelllous Mathletes Ellie Hunt and Maddison Ecob have both earned their Gold certificate this week. An awesome achievement girls, well done! Our individual winners this week are; in 3rd place - Ndanatsei, 2nd place - Max and in 1st place - Joey. Well done to all our winners. Our class winners this week with double the points of any other class are 4BW. We also have 4 (yes, 4!!!!) Gold certificate winners this week. Huge congratulations to Dacx, Bradley Mc, Molly and Thor. Year 4 reign supreme this week. 4CG are our winners with 4BW a close second! Well done year 4! Joshua B becomes our 8th Gold Mathletician. Well done Joshua - will you be the first to get your second Gold? Well done to Sophie R in year 3 who has become our latest gold Mathlete! A brilliant sustained effort gaining her the title of the top Mathlete so far this year. Here are Sophie's total scores. End of term results! Mathletics still counts!! 4BW and Molly Thirkell rule! 5CC return to the top - and every child earned a certificate! All change for winners this week - 5HC finish on top! And Rosana rules! 3 Gold certificates and Leighton rules! Well done to Sophie OB, Summer C and Aaron SB. Well done to 5CC! Back on top of the leaderboard at BSP for the first time this year! New winners this week in Mathletics! 31,317. In second place was 3RS with 27,657 points, and 3LK coming in 3rd place with a creditable score of 23,259. Our individual winners are Max Chen in 1st place with 11,428 points; Sophie Roe in second place with 10,625 and Leighton Jenkins with 10,566 points was third. Well done! Mathletics is working! 3LK continue to shine in Mathletics! 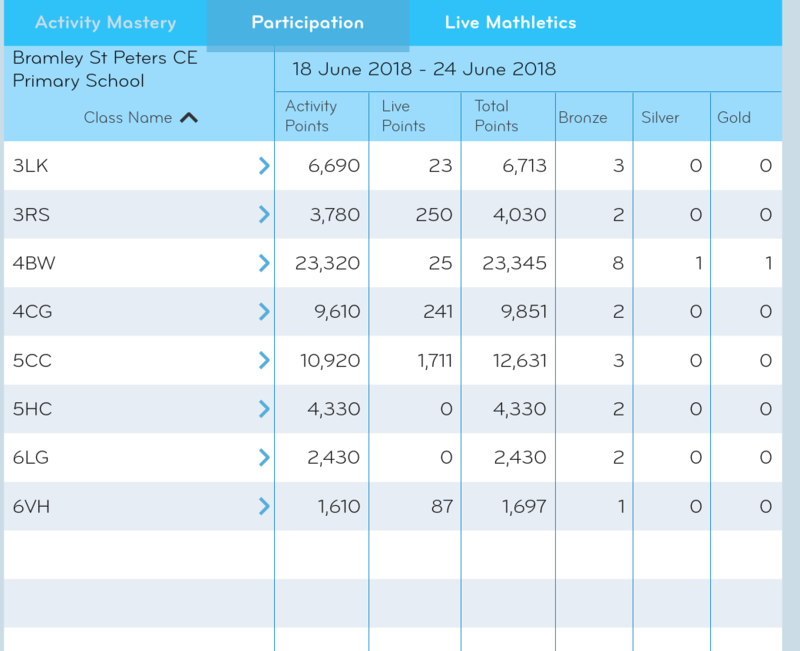 Yet again 3LK have shown their enthusiasm for Mathletics - their tremendous score of 20,046 points beat their nearest rival (3RS) by almost 3,000 points. 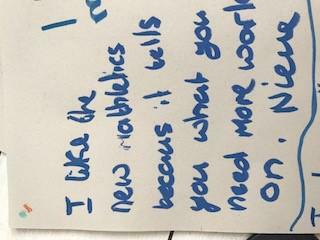 Sophie from 3LK continues her quest to be the best and won't let it rest! She wins the glass trophy yet again. Well done 3LK and well done Sophie. Well done Year 3! 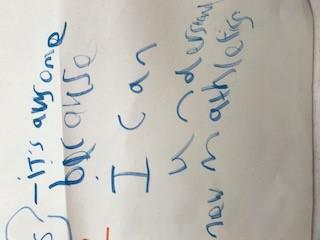 A super Mathletic start to the year! 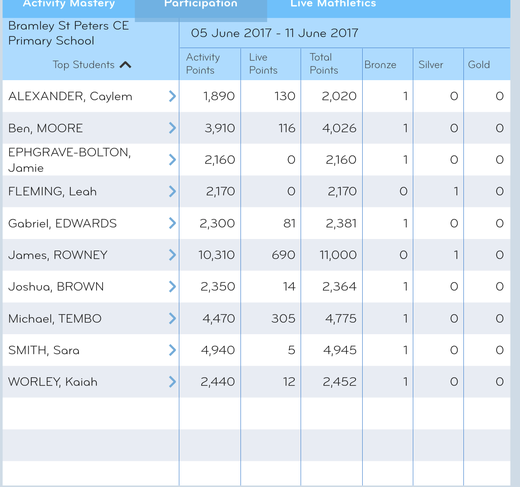 Mathletics week 1 autumn term - the champions regain their top position - well done 5CC. Well done to Sophie from year 3 who is our Mathlete of the week. Well done 3LK - class of the week! Well done James R - Mathlete of the week with 11,000 points. Great work!! New Mathletics. 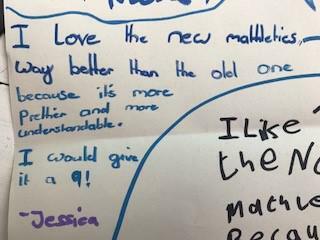 Loved by the product developer at Mathletics - BSP, we've 'made his month'! Gold number 9 and Gold number 10 for BSP! Well done to Gabriel and Joshua B for earning their 1st Mathletics gold certificate. An awesome achievement. 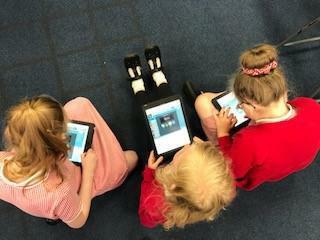 Our children continue to enjoy their Mathletics and are loving 'new' Mathletics. New winners in Mathletics this week! We say 'well done' to 4/5AG on winning the class trophy this week - their magnificent score of over 48,000 points is very impressive! Can you beat that score next week? 3LK were second with a still impressive 30,000; and 4GW came in third with 28,000 points. We also have a new winner of the individual trophy; with a score of 10,090 we say a massive 'CONGRATULATIONS' to Kaiah. In second place was Brya with 7,989 points and in third place was Gabriel with 3,477 points. We also passed the 1,000th certificate mark this week and Luca was the lucky person who will be receiving a prize! Gold number 8 for Bramley St. Peter's! Well done and huge congratulations to Sophie O'Brien on getting your MATHLETICS GOLD CERTIFICATE!! Looking forward to some of our children earning their gold certificates this week; Sara from Year 6, Lore from Year 5 and our very first Year 4 pupil to get gold - Bradley! Well done 5CC who are our champions again! We now have 4 Mathletes who have earned their Gold certificates. We done to our latest Mathletes - Chris and Joshua; both from 5CC. What a week for BSP Mathletes! We celebrated not 1, but 2 gold Mathletes. A massive 'well done' to Amelia and Tafadzwa. They were presented with their certificates in Collective Worship by Mrs Esplin and they have even had a song named after their achievement ('Gold' by a group called Spandau Ballet). Tafadzwa didn't even realise he had got his Gold - he couldn't have looked any more surprised if he had received an Oscar! 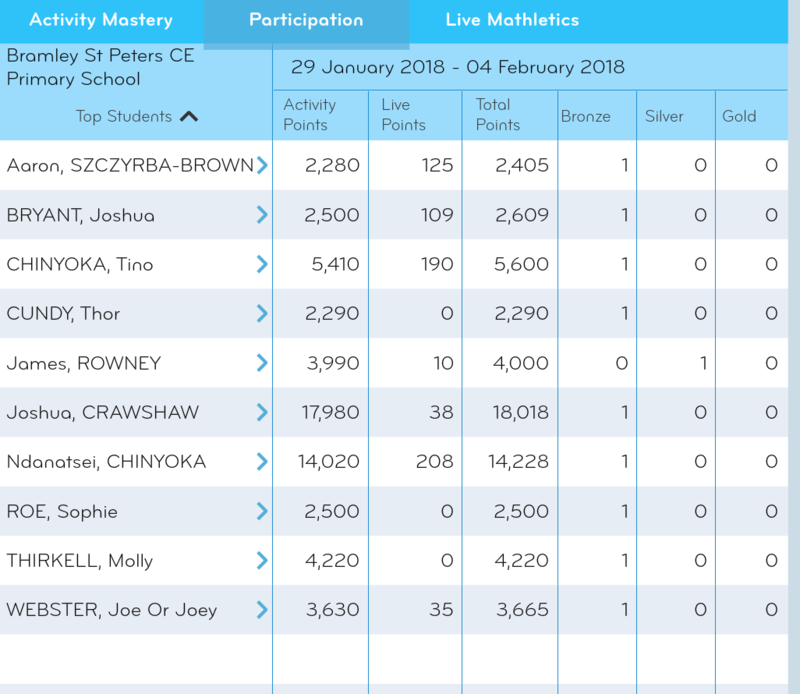 Below is a summary of our top Mathletes and the scores for the week. Well done to 4/5AG who are participating more - we do wonder if the up and coming year 3 children are posing a threat to the older children? Our wonderful Mathletes this week scored almost 200,000 points on their activities. A great achievement! Year 3 children have really entered into the spirit and have earned 25 certificates between the two classes. Together, year 3 have gained more points than the other year groups! Please have a look at the screenshot below at our top 10 Mathletes! Well done to Sara, Ben and Ndanatsei. Class of the week is 5CC with a magnificent score of 66,399 points - this is one third of our total points for the week! Our top 10 this week. Welcome to the newest Mathletes here at Bramley St. Peter's. 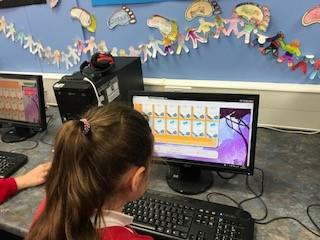 Our Year 3 children now have their usernames and passwords and are starting to explore the wonderful world of maths though activities and problems on Mathletics. Three of our 3SW children have even made it onto our top 10 board for this week. Well done to Tino, Marc and Benjamin. Noah and Archie also earned their first bronze certificate! Children in 3LK will be guided through Mathletics on Tuesday and we hope they enjoy using the program, to further improve their maths skills, as much as the children in 3SW are. 5CC are our winners this week, closely followed by 6VH, with 4GW in 3rd place. We are looking forward to next week when we hope all of year 3 are up and running and giving the older children some competition! Well done 5CC - the trophy returns to you this week! Our Mathlete of the week is Sara with a creditable 12,108 points. She is closely followed by Ben who managed to score 11,641 points. In third place is one of our youngest Mathletes, Tino (with 5,535 points), which gained him his first ever bronze certificate. Well done to all 3 Mathletes. Screenshot of this week's top Mathletes. All children in Years 4 to 6 do Mathletics and after half term, Year 3 children will be able to take part too! We have Mathletics clubs Monday to Thursday mornings before school - please see Mrs Taylor for details of how your child can join. We also have clubs on Tuesday lunchtime for Year 5 children; Wednesday lunchtime for Year 6 children and Thursday lunchtime for Year 4 children. There are on average 20 to 27 children at the lunchtime sessions. Children can complete homework in these clubs, and children who don't have access to a computer at home are given priority. Each week we have a celebration at the end of Collective Worship when we give out certificates and we name the Mathlete of the Week and Mathletics Class of the Week. Some of our children have even managed to get onto the top 100 Mathletes in the world! Oliver Northfield got to number 6. We have had 3 of our classes in the top 50 schools in the world!